Want to scour the web for a word or phrase without having to bother with the keyboard? Starting soon, you’ll be able to just say your search query into your PC’s microphone, and Google will take care of the rest. Also on tap: the ability to search on an image by dragging the image itself into the Google Images search box. Voice search on Google is nothing new—indeed, it’s been a feature on the Google Mobile app for a few years now—but this marks the first time that users could search by voice on a desktop PC. 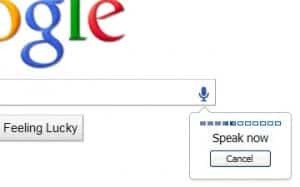 You’ll need to have the Chrome web browser installed and a microphone to test drive Google’s new desktop voice search, which should start going live in the next “several days,” according to Google. To speak and search, you just click a little microphone icon in the Google search box, wait for the “Speak now” pop-up to appear, and then … well, just start talking. So, when would you use Google’s new desktop voice search? Perhaps when you’re looking for a word that you can pronounce but not spell, Google execs suggested. Voice search could also be helpful for users who don’t have the use of their hands. Another interesting Google announcement Tuesday was image search—and by that, I mean performing a web search by actually dragging and dropping an image from your desktop to the Google search box. In a demo, a Google staffer dragged and dropped a snapshot of a person posing on an barren island. Within a second or two, Google returned its “best guess” for the image: the Greek island of Nea Kameni (check), complete with relevant web pages and “visually similar” images. Neat. Privacy fanatics should note that images dragged into the Google search box are uploaded to Google’s servers; that said, search exec Amit Singhai promised that Google will follow the same privacy protocols with images as it does with standard text queries. In any case, Google says its new “Search by Image” feature will go live over the “next few days”—and again, you’ll need to be using the Chrome web browser to make it work. So, what do you think: do you see voice search on the desktop or “search by image” coming in handy? Or are you just as happy to let your fingers to the searching?